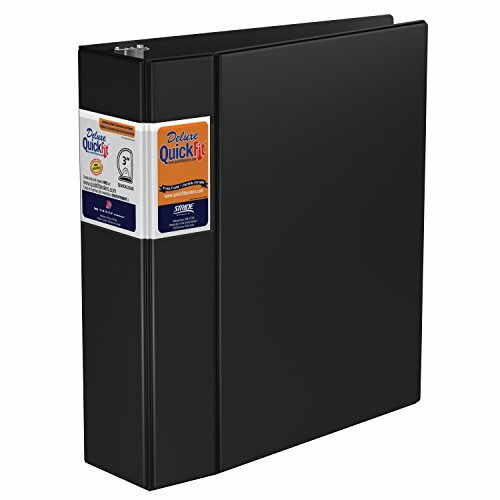 The QuickFit Commercial Binder features a space saving, double hinged cover that takes up less space on a shelf. Utilizing the unique QuickFit overlay design allows you to use a single sheet of paper to create a custom insert that wraps around the spine to the front cover for easy insertion and quick identification. Quickly customize your cover using our free online design tool. Constructed from commercial grade heavy duty polypropylene material for frequent reference and longevity. The Quickload ring makes it easy to load paper and saves you time. Holds 8.5" x 11" paper. Recycled Content: 100% recycled board with 85% post-consumer waste. PVC free. Antimicrobial material. Made in Canada. If you have any questions about this product by QuickFit, contact us by completing and submitting the form below. If you are looking for a specif part number, please include it with your message.